Upcycled skirt into a top. I started out with this daggy, overlarge skirt which I got at Vinnies for $3.50. 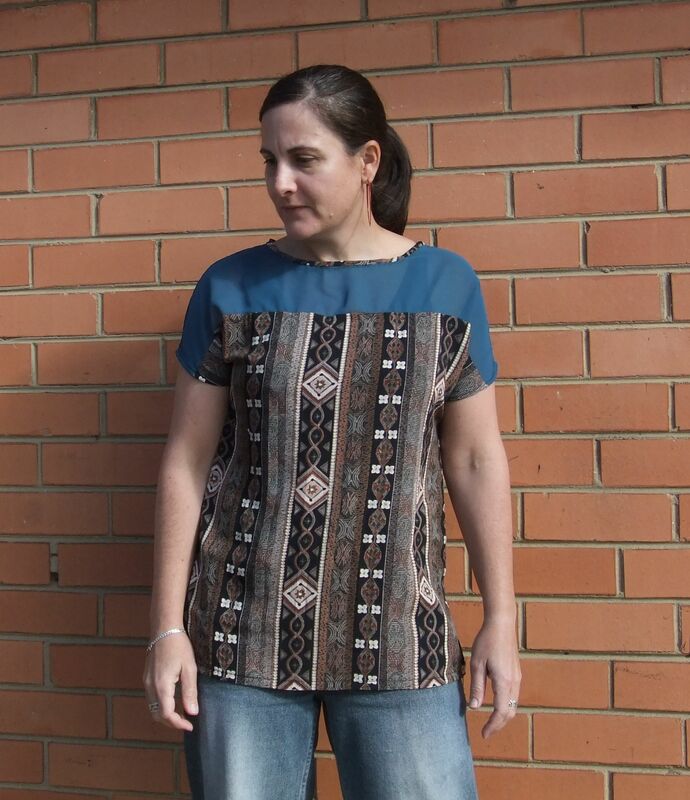 Now the words ‘brown polyester skirt’ wouldn’t normally strike excitement into my heart, but the print made me think of all those Ikat prints that are going around at the moment. Also, the fabric isn’t your regular nasty polyester – it’s quite heavy, with a nice drape, almost like cupro. 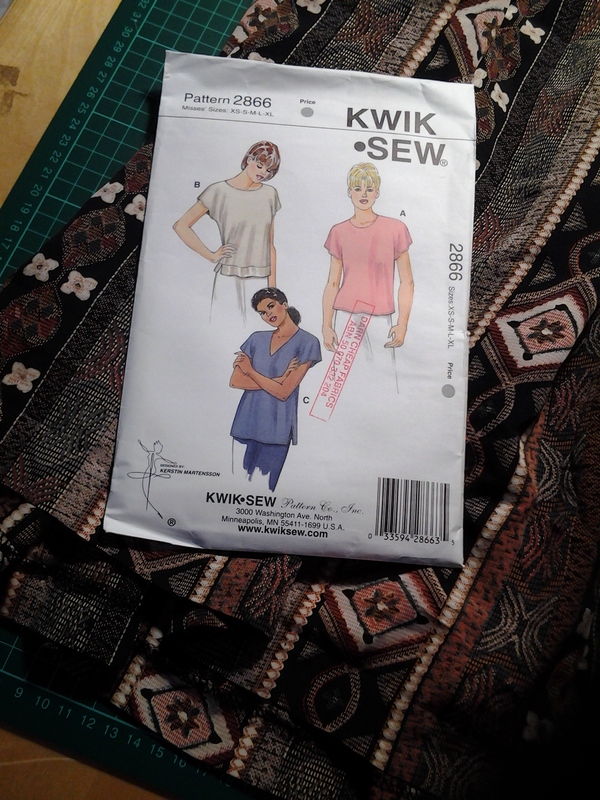 Now, I’ve currently got a thing for those boxy, square cut blouses – sometimes referred to as kimono sleeve – so decided to team this up with a simple pattern from Kwik Sew. 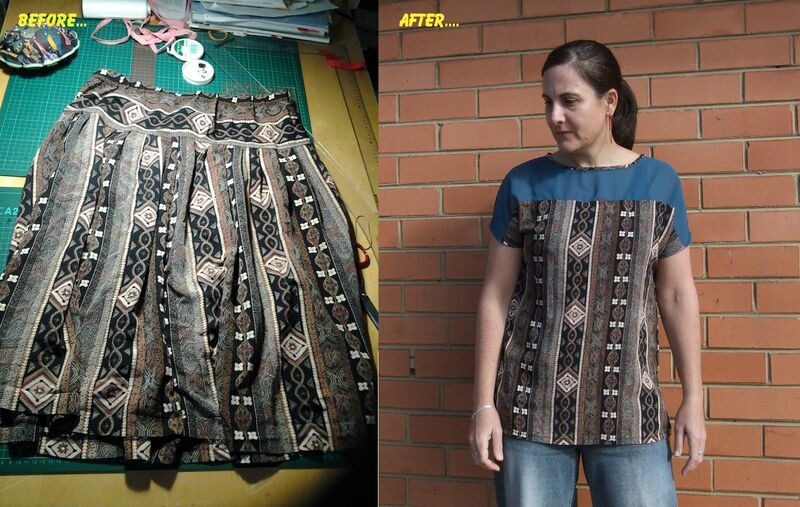 The skirt was quite heavily pleated, so I knew I’d have heaps of fabric to work with. Yes, the blue one looks a little bit like hospital scrubs. I stayed away from the v-neck. 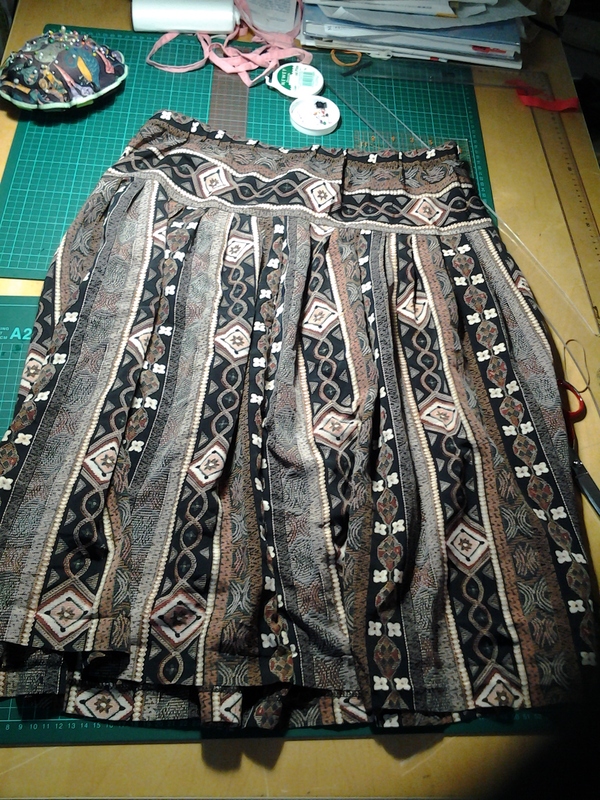 Once I had separated the main skirt from the elasticated yoke, I had about 2m of fabric, but it was only about 60cm long. I wanted the print to run vertically, but the thought of trying to piece and match that pattern gave me a headache. The Stash volunteered some turquoise-green chiffon. I wasn’t sure at first, but The Stash was right in the end. I got out my trusty tracing paper and made a yoke pattern for the upper part of both the front and back, and the rest was simple sewing (after a short but heated discussion with Ms Janome concerning appropriate tension for chiffon). 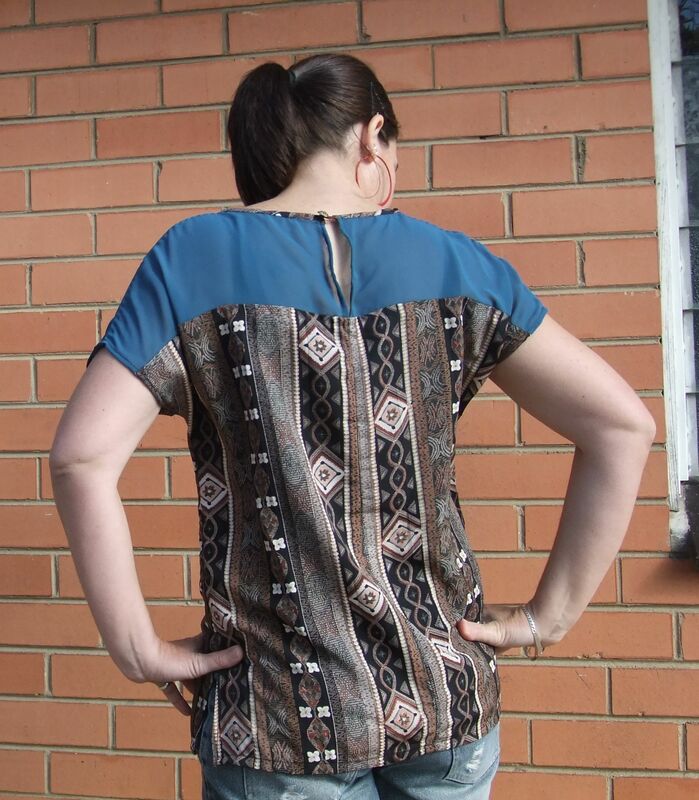 The yoke back neck opening was the simplest thing ever – I made it in two pieces, and hemmed the inside edge before I sewed it onto the rest of the shirt! It’s still a bit cold here to be wearing this by itself – we had a lovely warm snap but it has since cooled back down again – probably something to do with the election! I’ve only just realised, looking at these pics, that I actually managed to centre the print almost perfectly on the front – completely by accident! I tried to pattern-match on the back seam – although the skirt had a lot of fabric, there were a couple of seams in there, so I had to cut the back in two pieces. Hope you had a nice election weekend! OMG just love love love this top! Thanks for posting this to refashion first friday! You were one of our top clicked links!